James J. Ryan, 78, died Sunday, November 11, 2018, at a local hospital after a lengthy illness. He was born October 15, 1940, to the late John and Ethel (Mayer) Ryan in Milwaukee. 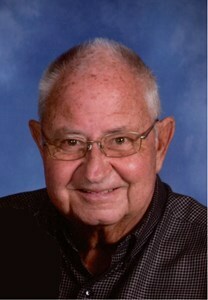 Jim was a 1958 graduate of Premontre High School and went on to attend the University of Notre Dame. On October 27, 1960, he married Sharon A. Van Ermen at Annunciation Catholic Church in Green Bay. Jim was a charter member of Resurrection Catholic Church. Jim thrived in the car business. He started as a wash boy, then moved up to a salesman and eventual owner of the House of Ryan, first with his father John, and later with his son Tim. His reliable support could be counted on by his family. He loved spending time on the golf course with many friends. Through the years, he and his wife Sharon enjoyed many trips to Las Vegas where he pressed his luck on the roulette table. But his greatest luck was his devoted wife Sharon, who stood by him in his illness until the end. Jim is survived by his wife and their children and spouses: Tim (Dawn) Ryan, Green Bay; Mary (Gary) Spielbauer, De Pere; Michele Ryan, Traverse City, Michigan; Marni (Paul) Slavik, Burlington, Vermont. He is survived by his eight grandchildren: Elle and Kyla Ryan; Kelsey and Brady Spielbauer; McKenzie and Madissen Miller; Evey and Maelyn Slavik. He is also survived by his siblings and their families: Joan (Nic) Wahl, Pat (Tammy) Ryan, Kathy Kapalin, and sister-in-law Barbara Van Ermen. Jim was preceded in death by his parents, John and Ethel, in-laws Emil and Florence Van Ermen, niece Melissa Kapalin, and brother-in-laws Daryl Kapalin, Keith (Carol) Van Ermen and Dale Van Ermen. Private family services are being held. Newcomer Cremations, Funerals & Receptions is assisting the family. In lieu of flowers, please send contributions to the Greater Wisconsin Chapter Alzheimer’s Association (www.alz.org/gwwi; (920) 469-2110; 3313 S. Packerland Dr., Suite E, De Pere, WI 54115); Unity Hospice Care (unityhospice.org; (920) 338-1111; 2366 Oak Ridge Circle, De Pere, WI 54115) or Curative Connections, curativeconnections.org: (920)593-3510; 2900 Curry Lane, Green Bay, WI 54311. Jim's family expresses their deep gratitude to the caregivers of Wyndemere, the 9th floor staff of St. Vincent Hospital, and Unity Hospice for their compassion and care. To share a memory with Jim's family please click on the share memories button above. Add your memories to the guest book of James Ryan. To the Ryan family , I am so sorry to hear of Jim's passing. I worked for Jim for 25 years and he was the best. He was a great boss and a very generous man. I really enjoyed my time there.We sure had some great times . To Sharon and the rest of the family , you are all in my thoughts and prayers , I will never forget him. Sharon, I am sorry for your loss. May God bless your family and comfort you. I worked for both John and Jim when the dealership was On Main St.
She was in college and worked evenings. Our Sincere Sympathy to the Ryan Family. We loved Jim and his family. So sad to hear this news. He brought life to every gathering and we smile when remembering all the good times. Our condolences to the Ryans. May the Good Lord wrap his arms around our dear friend Jim. May his Memory be Eternal.